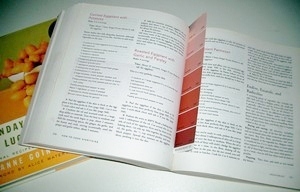 Accidental Locavore Asks: What Do You Think Are Essential Cookbooks? What Do You Think Are Essential Cookbooks? Have you ever thought about the one or two cookbooks you use that are essential? The Accidental Locavore just got through reading Amanda Hesser’s piece in the NY Times, when my BFF asked me for a cookbook recommendation. She wants a good starter book for a friend who has just moved into her first apartment and I remembered the Times article. When you read what other people consider crucial and you own the book, don’t you immediately want to run to the bookshelf and review it? I do. Case in point, Sunday Supper at Luques (gathering dust on my shelf), Amanda Hesser’s go-to for inspiration. Just picking the book up reminded me why this is not on my hit parade. While it may sound petty, the Accidental Locavore hates cookbooks that are grouped by menus (come on, do you ever cook a whole menu?) instead of categories (like soup, salad, etc.) and isn’t fond of books that are arranged by seasons. This may sound crazy for someone who is focused on local and fresh, but what’s in season in LA is very different from NY (duh). Unfortunately for Sunday Supper, it (as the Brits would say) ticks both those boxes. My answer to my BFF was either Julia Child’s The Way to Cook, Mark Bittman’s How to Cook Everything or The Essential New York Times Cookbook. Here’s why: Mastering the Art of French Cooking, while a masterpiece, is a very detailed book and, for a beginner, intimidating. The Way to Cook is more of a modern take, a lot less intimidating and has a good selection of recipes. It’s become my go-to when I’m looking for a classic French recipe (and then I flip back to Mastering for comparison). As much as Mark Bittman can be a little annoying, How to Cook Everything, does give you good directions for cooking almost everything. When we got our house upstate and I was trying to figure out what basic cookbook I wanted to start the upstate collection with, that was the one I went to. The two most stained recipes? His buttermilk biscuits for strawberry shortcake and eggplant Parmesan. And The Essential New York Times Cookbook? While I might not agree with Amanda Hesser’s fundamental cookbook list, I often find myself referring to the old Craig Claiborne version. It’s more interesting to me than the Joy of Cooking, which is comprehensive but rather ordinary. I don’t own the new version, but from what I’ve seen of it, the reviews and what I know about Amanda, it’s a sure thing (and if anyone wants to give me a copy, feel free). When the Locavore posted the cookbook question on Twitter, the response was fascinating. My friend Serge, from Serevan, suggested Elizabeth David. Someone else was a fan of Ratio by Michael Rhulman (a book my father swears by) and a third favorite was The America’s Test Kitchen Family Cookbook. Here’s my question to you: what book would you recommend to a new cook? And what is the one that’s essential to you? I find myself reaching for James Beard’s American Cookery quite often. I agree with you on your selections. For the VERY beginning cook, I’d have to cast a vote for the one that taught me and generations before and after, the red plaid ring-bound Better Homes and Gardens Cookbook. I think once someone has learned to boil an egg and make basic potato salad or a grilled cheese sandwich, then Julia’s book would be the next step to learn gain the understanding of why. Still have the 1971 BH&G I purchased, soiled but intact. Their recipes are tested and pretty foolproof, and basic enough not to frighten away a newby. May not get a lot of votes but I’m not interested in being pretentious or impressing anyone at my age! I’ll have to try Julia’s moussaka. I’ve always used her recipe for Pâté de Campagne. I have Bistro Cooking and refer to it often but then move on to other versions… Don’t you think “essential” evolves? 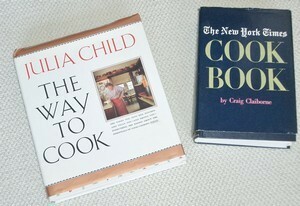 For the new cook, no question about it: Julia Child’s The Way To Cook is IT. You feel like Julia’s right beside you, patiently (and with good humor) teaching you to understand what you’re doing in the kitchen and why you’re doing it. My personal favorites from the book are her Untraditional Moussaka and the great Tarte Tatin.